We’ve taken a close look at Purina and graded it according to the We’re All About Cats standard, evaluating the brand on species-appropriateness, product variety, price, ingredient quality, customer experience, and recall history. We’ve rated the brand on six key criteria for quality. In total, we give Purina cat food a 36 out of 60 rating or a C+ grade. 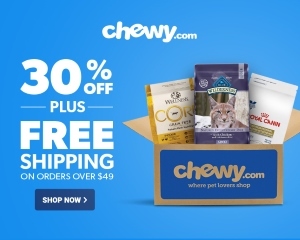 Click here to shop for Purina cat food on Chewy. Purina is one of the largest and oldest companies in the cat food industry. It started in 1894, when a group of three entrepreneurs founded the Robinson-Danforth Commision Company. Believing that animal feed would sell despite the poor economy, the company started packaging up a mixture of molasses, corn, and oats and called it horse and mule feed. During the next few years, the company expanded, got a new name, and explored various product offerings. In 1926, the company, now called Ralston-Purina, established a pet nutrition and care center, where they developed their first pet foods. Purina Dog Chow was introduced in the 1950s and reached national distribution in 1957. A few years later, cats, too, had a Purina food to chow down on. Purina Cat Chow was introduced in 1963. The company’s growth continued through the 20th century, as they added on multiple brands, including household names like Friskies, Fancy Feast, and Kit & Kaboodle. In 2001, Purina merged with the Swiss food giant, Nestlè. Today, Nestlè-Purina is the second-biggest pet food company in the world. In 2017, Nestlè-Purina PetCare generated over twelve billion dollars in revenue. Put together, Mars Petcare, Inc. and Purina Petcare earn about half of the revenue in the global pet food industry. Purina says that most of their ingredients are sourced from North America, but grants that they will source from other countries when necessary. For example, their grains are sourced from the United States and Canada. Most of their meat ingredients are sourced from the United States, with the exception of New Zealand lamb. Their vitamin packs are sourced from suppliers around the world. All of their ingredients must meet or exceed FDA, USDA, or AAFCO standards for pet food and comply with Purina’s standards for ingredient safety and specifications. Most, but not all, Purina foods are manufactured in company-owned manufacturing facilities. Purina operates dozens of plants in the United States and Canada. In addition to USDA and FDA regulations, the manufacturing process is overseen by onsite quality assurance staff and laboratories. Has Purina cat food been recalled? Purina has issued several recalls during its 90-year history in the pet food industry. Here’s a brief overview of Purina’s recalls in the last two decades. In March, 5 varieties of Purina Pro Plan wet dog food were recalled due to inadequate levels of vitamins and minerals. In 2015, California dog guardian Frank Lucido filed a class action lawsuit against Purina, alleging that over 1,400 dogs, including three of his own, became sick or died after eating Purina Beneful dog food. Analysis of Beneful dog food samples found that the foods contained three toxins—propylene glycol, mycotoxins, and heavy metals. The levels of these toxins, however, didn’t exceed the FDA’s permitted limits. Ultimately, the court ruled in Purina’s favor. The United States District Court for the Northern District of California ruled that the lawsuit failed to prove that Beneful was unsafe. You can learn more about the lawsuit here. Purina initiated a United States market withdrawal of their Waggin’ Train products after the New York State Department of Agriculture and Markets found trace amounts of antibiotic residue in the treats. These antibiotics are considered safe in small quantities. They’re legal in several countries, including China, where the treats are manufactured, but not in the United States. Later in 2013, a batch of Purina ONE dog food was recalled due to low levels of thiamine. A single lot of Purina Veterinary Diets OM Overweight Management Feline Formula was recalled due to inadequate thiamine levels. Some Purina cat foods were recalled due to possible salmonella contamination. Purina recalled all sizes and varieties of Alpo Prime Cuts in Gravy dog food due to potential melamine contamination. What kinds of cat food does Purina offer? Purina stands behind some of the most easily-recognizable brands in the cat food industry. 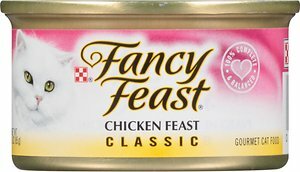 Fancy Feast was created in 1982 and is positioned as a gourmet cat food providing delicious, sensory experiences for cats. Fancy Feast includes over 100 recipes, including patés, broths, and morsels in gravy. 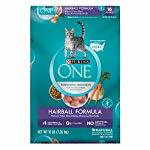 Purina ONE is marketed as a top-of-the-line cat food “dedicated to the lifelong potential of your pet”. The brand includes dry and wet foods. Friskies is one of the oldest and most popular cat food brands. In 2017, it was the United States’ leading wet cat food, generating almost 586 million dollars in sales. The Friskies product lineup includes economy-level dry food, wet food, and treats. 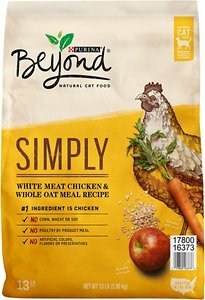 Beyond is Purina’s natural food line. All Beyond foods are free of corn, wheat, and soy, with no poultry by-product meal or artificial colors, flavors, and preservatives. Purina Beyond foods are made in US facilities and are covered by Purina’s Traceability Guarantee. The brand’s Simple Origins line is Non-GMO Project verified. The Beyond cat food lineup includes wet cat food, dry cat food, and treats. Purina Deli-Cat is a low-cost dry food. It’s a plant-based, corn-heavy food made with the flavors of turkey, fish, and liver. Similar to Deli-Cat, Kit & Kaboodle is an inexpensive cat food brand. It offers just two recipes, and both are dry foods. Purina Muse cat food is available in dry and wet varieties. All Muse cat foods are made with natural ingredients and are covered by the brand’s “Clean Plate Guarantee”. This guarantee promises a refund if your cat doesn’t love the food. During Purina co-founder William Danforth’s experience as YMCA secretary in World War 1, he observed that soldiers got excited when their meals were called “chow” rather than “food”. When he got back, Danforth substituted the word “chow” for “feed” in the names of all their products. 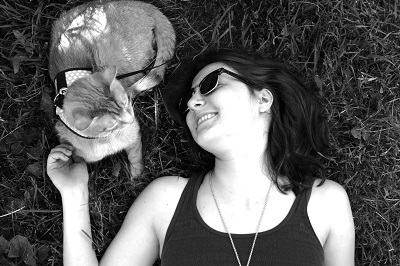 When Purina started making cat food in the 1960s, they called it Cat Chow. Today, Purina Cat Chow is available in a variety of formulations for unique needs, including life stage and lifestyle. Purina Pro Plan was developed in 1986 and, according to the company, was the first brand of pet food to feature real meat as the first ingredient. There are four lines of Pro Plan cat food. The Savor line offers a variety of aromas, tastes, and textures. Focus provides nutrition geared towards specific health needs, including hairballs and urinary tract health. The True Nature line emphasizes instinct-satisfying, meat-based foods. The Prime Plus line is developed for senior cats age seven and over. This is Purina’s line of prescription diets for specific health needs. The lineup includes food for dental health, diabetes, GI issues, allergies, and more. Chicken and chicken meal appear to be the primary protein sources in this dry cat food. Like all Purina Beyond recipes, this dry food concentrates on recognizable, natural ingredients. Chicken and chicken meal are the first ingredients, followed by a variety of grains and other plants, including whole barley, rice, whole oat meal, and pea protein. The food is free of artificial ingredients, including artificial colors, flavors, and preservatives. Overall, this dry cat food has moderate protein content, moderate fat, and high carbohydrate content. It has 421 calories per cup. Corn and poultry by-product meal appear to be the primary protein sources in this wet cat food. Like most other foods for indoor cats, this Purina Cat Chow recipe is based on the premise that indoor cats are prone to hairballs and obesity, necessitating a low-calorie, high-fiber diet. It also contains what Purina calls an “immune health blend” of antioxidants. The first ingredient in this food is corn meal, followed by poultry by-product meal, corn gluten meal, and soy flour. Plant ingredients appear to provide the majority of the protein in this recipe. Powdered cellulose and soybean hulls serve as sources of fiber. Purina Cat Chow Indoor Complete contains multiple artificial colors, including Red 40, Blue 2, and Yellow 5, all of which are linked to serious health and behavioral issues. Overall, Purina Cat Chow Indoor Complete is a plant-based dry cat food with moderate protein content, low fat, and high carbohydrate matter. Like most indoor formulas, it’s relatively low-calorie with 361 calories per cup. This popular canned cat food is made primarily from chicken, followed by poultry broth, liver, meat by-products, and fish. The food contains a few artificial ingredients, including artificial flavor and added color. Food dyes have been linked to multiple health issues among animals and people and may be worth avoiding. Because the dye is anonymously referred to as “added color”, it’s impossible to know which dye is used and which potential health effects it brings. It’s thickened with guar gum, which is a natural thickener and stabilizer derived from guar beans. While common in wet cat food, guar gum isn’t a natural part of the feline diet. Overall, this is a meat-based, high-protein cat food with moderate fat and moderate carbohydrate content. There are 99 calories in each 3 oz can of this food. Chicken, Poultry Broth, Liver, Meat By-Products, Fish, Artificial And Natural Flavors, Tricalcium Phosphate, Guar Gum, Added Color, Salt, Minerals [Potassium Chloride, Magnesium Sulfate, Zinc Sulfate, Ferrous Sulfate, Copper Sulfate, Manganese Sulfate, Potassium Iodide], Taurine, Vitamins [Thiamine Mononitrate (Vitamin B-1), Vitamin E Supplement, Niacin (Vitamin B-3), Calcium Pantothenate (Vitamin B-5), Vitamin A Supplement, Menadione Sodium Bisulfite Complex (Vitamin K), Pyridoxine Hydrochloride (Vitamin B-6), Riboflavin Supplement (Vitamin B-2), Vitamin B-12 Supplement, Biotin (Vitamin B-7), Folic Acid (Vitamin B-9), Vitamin D-3 Supplement], Sodium Nitrite (To Promote Color Retention). D-6672. What do customers think of Purina cat food? Millions of people buy and feed their cats Purina cat food every day. Most customer reviews are positive, saying that Purina food is affordable and appetizing. At the same time, Purina gets its share of negative comments. As we saw in the 2015 Beneful lawsuit, thousands of people have reported that their cats and dogs got sick after eating Purina food. With a reach as broad as Purina’s, it’s hard to know which of these incidents are coincidences and which are the result of something Purina did wrong. How much does Purina cat food cost? Their products range from ultra-cheap to premium, covering everything from grocery store kibble to veterinary products available by prescription only. There’s a Purina food for every budget. If you’re shopping for wet food, daily feeding costs range from about $1.22 per day for Friskies cat food up to $6.40 a day for Muse grain-free filets in broth. Purina’s dry foods are cheaper than their wet foods. Kit & Kaboodle, for example, will cost about $0.09 per day. Purina Pro Plan Veterinary Diet DM costs about $0.71 per day. 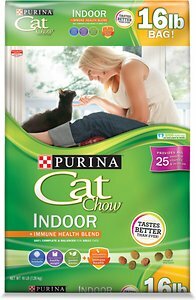 Overall, is Purina a good choice? Purina cat foods are affordable, easy to find in stores around the world, and cats usually love the way they taste. However, they aren’t the safest or the most species-appropriate choice. The company has initiated at least five recalls and one market withdrawal since 2004, and most of their recipes contain at least a few artificial ingredients and plenty of plant matter. If you choose to buy Purina food, opt for their wet foods, which have higher meat content, lower carbohydrates, and provide the hydration cats need. Purina Muse stands out as their simplest wet food, while some canned Pro Plan and Beyond recipes may also be a good choice. If you’re on a budget, Purina Friskies and Fancy Feast are good options to consider. While they contain animal by-products and artificial ingredients, these foods are more carnivore-appropriate than most dry foods and some premium wet foods. Purina cat food is easy to find in grocery stores, pet specialty retailers, and big box stores around the world. Online, you’ll find it on Amazon, Chewy, and a variety of other online retailers.